A simple prediction about the Affordable Care Act’s impact on health care access might go something like this: we have too few primary care providers and expanding coverage is going to cause a spike in demand that those providers can’t meet. Doctors will either refuse to see Medicaid patients or will do so at the expense of the privately insured, who will see longer wait times. Ergo facto, access will suffer. The outlook is bleak. Well, maybe. But a new NBER working paper from Tom Buchmueller, Sarah Miller, and Marko Vujicic serves as an important reminder: supply-side effects matter, too. That is, providers can change the way they practice to accommodate new demand, but the studies on provider behavior are much scarcer than demand-side (patient behavior) literature. Buchmueller et al examine how changes in Medicaid’s dental benefits—optional for states to provide for adults—influences dental practice. Dentistry might not seem like the most obvious place to search for lessons for the ACA, but it’s actually pretty excellent: dentistry is a form of preventive care and, like traditional primary care, there’s growing worry over a provider shortage. There’s also concern about low participation in the program due to low reimbursements; evidence suggests that access is improves when Medicaid covers dental, but only 39% of dentists in the sample reported serving Medicaid patients. Dentists often work with hygienists, much as a physician can work with nurse practitioners or physician assistants. So, what happened when states introduced dental benefits in adult Medicaid? Dentists didn’t just find a way to accommodate new demand—they did so while increasing their incomes by 7% on average. We find that when states expand Medicaid dental coverage for adults, there is an increase in the percentage of dentists that participate in the program and an increase in the supply of services to publicly insured patients, with no decrease in the number of visits for other patients. Dentists accomplish this mainly by making greater use of hygienists: following the expansion of public coverage, dentists employ a greater number of hygienists and hygienists provide about 5 additional visits per week. As a result, dentists’ income increases following the adoption of Medicaid adult dental benefits by approximately 7 percent. These effects are largest among dentists who practice in poor areas where Medicaid coverage is most prevalent. We also find that these coverage expansions cause wait times to increase modestly [less than a day, on average]. However, this effect varies significantly across states with different policies towards the provision of dental services by hygienists. The increased wait times are concentrated in states with relatively restrictive scope of practice laws. We find no significant increase in wait times in states that allow hygienists greater autonomy. This has pretty self-evident lessons for coverage expansion under the ACA. Just as dental hygienists were able to help meet new demand, researchers have highlighted that reorganizing how we deliver medical care—delegating more tasks to nurses, pharmacists, and other clinicians—could go a long way toward easing the PCP shortage. 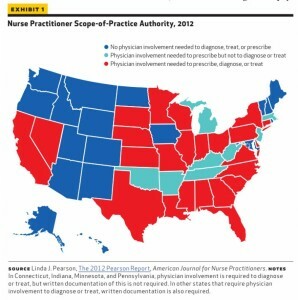 And like with dental hygienists, defining scope of practice falls squarely to the states, illustrated in the map below from Health Affairs. Maximizing access doesn’t rest exclusively on expanding the role of non-physician clinicians; innovations like retail clinics will also play a role. But this paper suggests that scope of practice will play an incredibly meaningful role in access and variation in access—and that there are actions that states can take to ease coverage expansion. You should go ahead and add that to the list of implementation issues that will play out at the state—not national—level. The paper is ungated, and well worth reading in full.